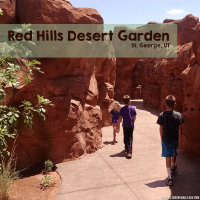 Scout Cave is a free hike that is great for hiking with kids in southern Utah. 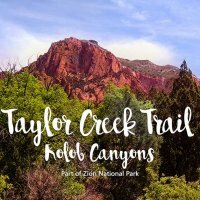 Scout Cave is accessible just outside Snow Canyon State Park, but also via the Chuckwalla Trail on the north side of St. George, UT. 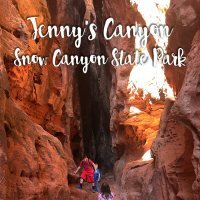 My review will take you to Scout Cave via the Johnson Canyon Trailhead just outside Snow Canyon State Park. 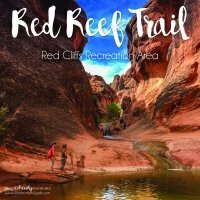 This trail is referred to on the Red Cliffs Desert Reserve website as moderate to strenuous. The trail follows a rocky (lava rock) trail. About one mile in to the trail you will drop in to a wash and then the sandy (sometimes muddy) trail continues up the other side of the wash and climbs the rocks in to the cave. There is a large set of stairs that is probably equal to four flights of steep stairs. Be prepared. The total elevation difference in this hike is about 800+ feet. This is equal to eight flights of “stairs” and/or rocks that you are climbing in and out of. Starting out at the Johnson Canyon Trailhead, you will follow the trail until you see a fork in the road. During March-June Johnson Canyon Trail is closed (except with scheduled ranger guided tours). You will veer to the right just before the fence and gate. Make sure that you and the kids are wearing shoes with sturdy soles. The lava rocks are sharp and the kids will constantly trip on them (I mean, I did…so just imagine the little ones!). There is a lot of opportunity for rolled ankles; please be careful. The Scout Cave trail is clearly marked for the first mile. This is great when hiking with kids because you can feel confident enough to let the older ones forge ahead. Our family rule is always if you can’t see me, you’ve gone too far. If they get out of eye-sight, they know they have to park it until we get there or they can see us again. This usually works well enough to allow them a bit of freedom. This trail is very popular and there were a lot of people while we hiked (Saturday afternoon). Crowded trails are not my favorite, but even with all the people walking back and forth, Scout Cave was still enjoyable. Most of the trail is wide enough that you won’t need to completely stop to allow people to pass. Just remember: when hiking on hills or inclines, be courteous. Travelers going UP have the right of way! 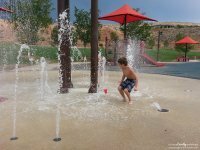 You do walk through a wash. A wash is a natural area where water flows during rain storms. Because of this when hiking Scout Cave during rainstorms: be careful!! Flash flooding can and will happen. If visiting after a storm know that could be muddy. We had very light rain a few days before and some areas were quite wet making a great place to slip and fall. You can thank my daughter for making this observation…and trying it out…you know…just to be sure. There are some areas I would consider drop-offs. Nothing insane, but enough to make me worry about my clumsy 6 year old. This would be a good area for you to hold the hand of young ones, or even pick them up. Look up! You can see two caves tucked in to the hillside! The stairs! Okay, full disclosure: I read 3-4 websites before I went on this trail with the kids. No one mentioned the stairs. I thought I saw some in a picture, but no one said anything about them. Not a huge deal, but I was surprised no one felt inclined to mention it (hence my reasons for doing this website!!). The stairs are probably a good 4 flights worth (note the picture below and all the steps above our heads). My thighs apparently need to get out more and the kids were huffing and puffing a little more than normal. They survived, but now you know! Once you get up the stairs and move towards the very obvious trail, you can choose various ways to get in Scout Cave. There are two caves but the one you want will be the left-most cave. In the picture below you can see the cave with somewhat of a trail (err, rocks you climb) to get up inside the cave. It took us a bit to decide which route to take. Nothing is marked and everyone seemed to be leaving the trail to go up. I am such a stickler for rules and saw a well traveled trail in front of us. The kids weren’t too happy I made them follow the trail. In truth, I have no idea which way the park would prefer we go, so this is where you can choose your own adventure. Bypassing the trail you see below (with me standing next to trying to decide) is really just a zig zag back to the cave. Most people head left here (where the girl in the blue shirt is) and go climb up to the rocks and then cave. We followed the trail at first, but when exiting the cave we came down through the rocks, bypassing the trail. I will say that if we didn’t initially follow the trail, the kids wouldn’t have seen the desert tortoise! So…win for me! Following the rules can pay off! The inside of the cave is HUGE! Much larger than I anticipated. Climbing the rocks in to the cave isn’t too difficult, but it does require climbing. I saw all ages of children in the cave, but those who had toddlers packed them in a hiking backpack to get in and out (letting them free to roam once in the cave). I would guess that a 4 year old could manage up the rocks on their own if a parent was following behind them (there is loose rock and sand that can make some areas slippery). The kids will want to stay and play forever. If you have the room, pack some food and have a lunch!! Just don’t forget to pack out all of your garbage. 4 miles round-trip (Plan for 2+ hours, more if young children are walking). Bring plenty of water (if hot, double what you would normally bring). Can access Scout Cave via Johnson Canyon Trailhead or various trails around Chuckwalla Trail.